I can’t believe it’s that time of year already. Seems like yesterday we were chasing swarms and working to keep up with the spring explosion. This year, it looks as though we’re going into winter with 5 hives. I do no go into winter optimistically. The bees are resilient, but anything can happen between now and spring. I keep moving forward, try to do the right things and hope for the best. I went into last winter with 3 hives and came out with 2. Ventilation was the big issue. Bees can handle cold, but they can’t handle wet. The lost hive contained lots of moisture. So above keeping them warm, I want to be sure the hives have good ventilation. I took advantage of yesterday’s 70 degree weather to do some winter inspecting and prep. 1) Check for strong hives. I did not check for the queen this time, since I did find brood two weeks ago and the numbers look good in each of the boxes. I’m not messing with them, since that does more damage than good. Brood is at bottom, stores are at top. My overwintered hives have lots and lots of stores, even Green Hive despite the robbing episode. Mint and Purple Hives, my two new hives, are lower on stores but feeding like crazy. I’m continuing to feed them like crazy so they can stash it away, and I’ll give them both several frames of honey left over from last years hives. That’s 2 parts sugar to 1 part water – all hives are feeding right now in hopes that they’ll pack it away and have plenty to eat for winter. I always use Honey B Healthy (HBH). In fact, I make my own HBH which contains organic wintergreen, lemongrass and spearmint essential oils to help keep their guts clean and to help ward off varroa. I’ll post the recipe soon! Just as effective, and much cheaper than buying it. If you do purchase HBH, use 1-2 tsp per gallon of syrup. 1. They’re inexpensive and and easy to make. Especially nice when you have a bunch of hives. I simply drill 10-15 holes in the top center of the lid using 1/64 size drill bit. 2. They’re easy to collect and fill as needed. 3. I put 2 jars in, so when one empties, I can remove and they still have syrup left in the second jar until I fill the first jar up again. 4. Easy to see what they’ve consumed through the clear glass. 5. They fit securely within a medium box. 6. They dispense the right amount of syrup, so there’s less chance of it sitting and crystalizing. And if it does crystalize, you can see it through the jar. 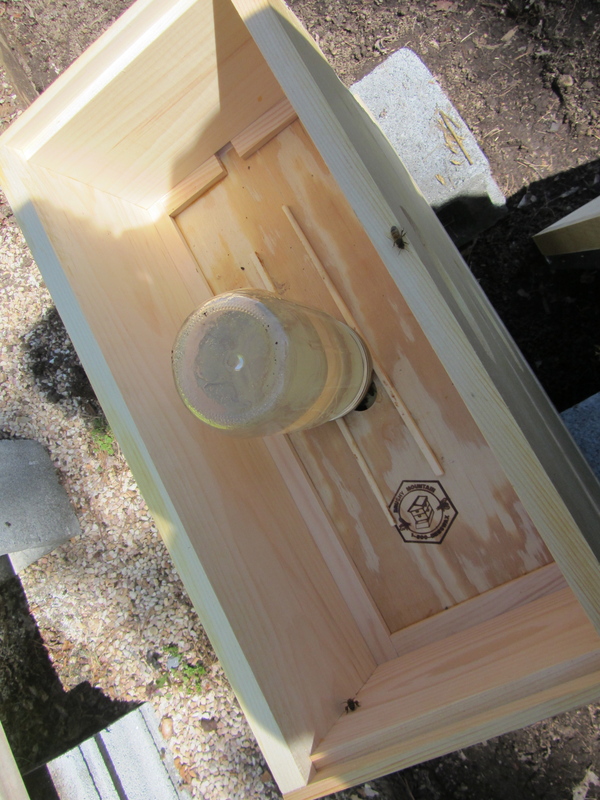 I place the feeders on a set of wooden or plastic chopsticks so the bees can fit beneath the jars. After awhile, they become a permanent part of the inner cover as the bees glue them in place. An easy supplement to help ward off tracheal mites. Click here for my Grease Patty Recipe. We had our first front/freeze warning, so I installed my mouse guards so the little critters can’t make their home in my hives. I used the Brushy Mountain mouse guards last year, which worked fine. 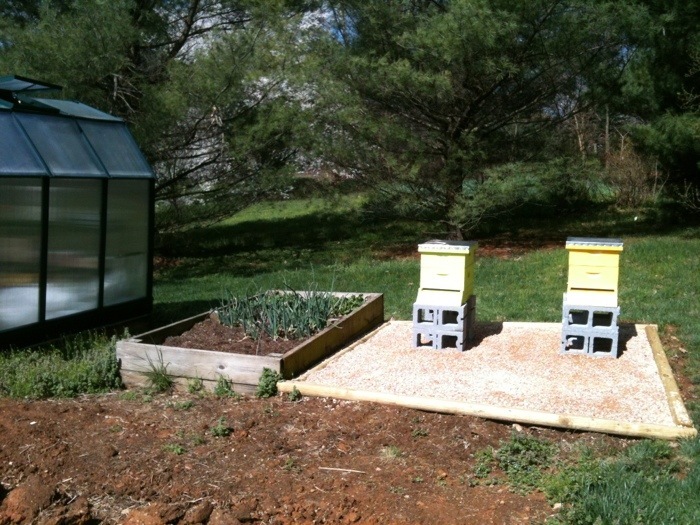 But I find myself going with the easy, less expensive options as my apiary has expanded. 1/2 inch hardware mesh works great. I set the entrance size to larger to prevent bottlenecking, and to allow for a bit more ventilation. That’s it for now. Our first round of winter prep. I have a few more tricks up my sleeve to help them out this winter, but the bulk of the work will be up to the bees! 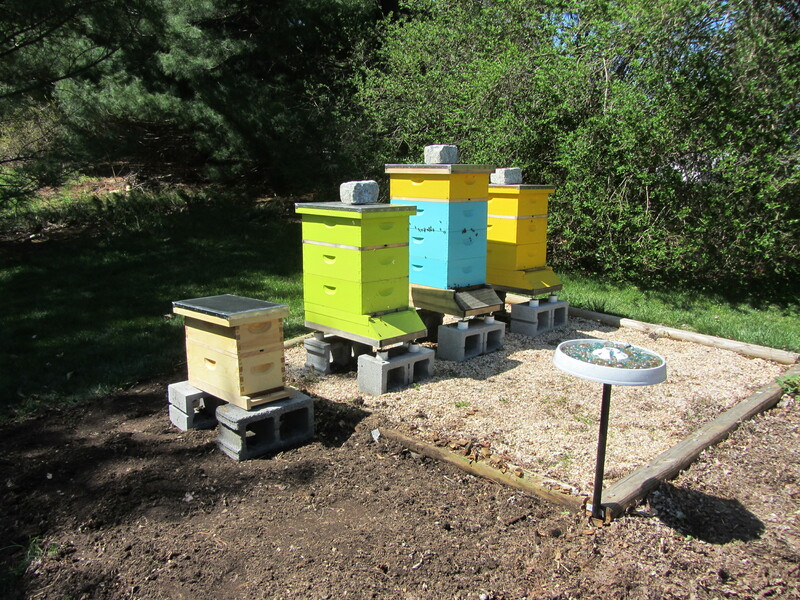 You’ll recall from my previous post “Prepping the Girls for Winter” that I had just added a mite treatment (ApiLife Var) to Green and Yellow hives, and I swapped out the feeders for the “no drown” top feeders. You may also recall that I included a list of recommendations when using the mite treatment. However, the following day, I realized I left off one very, very important recommendation…. Check the Weekly Weather Forecast Before Treating!!! When using certain mite treatments, the temperatures must remain below 90 and above 53 degrees. I thought I was in the clear because the weekend was gorgeous. Then the hubster, also known as Doppler Don, told me the temperatures would excel into the low 90s by mid-week. Of course he tells me this AFTER I already added the mite treatments. Keep in mind, I’m already losing sleep thinking about my poor girls being fumigated out of their home for the next 3 weeks. Now they’re at risk because I didn’t check the temperatures for the week ahead. Ugh!!! 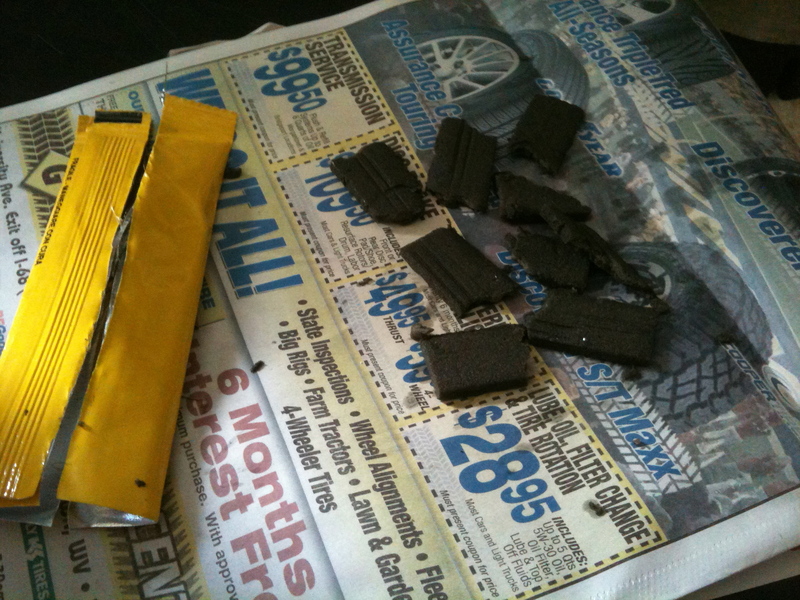 So I made yet another snap hive management decision and was determined to remove the tablets that evening. But wait, I had a vet appointment and another meeting scheduled that night. Ugh! The tablets should be caged in some sort of mesh or wire. That way the bees can’t chew on them, and they won’t so easily fall between the frames. In fact, you could even staple them to the frames to ensure they stay in place. Next time (assuming I actually try to do this again), I will cut pieces of window screen and will staple around the tablets to create a sort of mite treatment pillow. I closed up the hives and ended with feeding. This was my first time filling up the new feeders, which I thought would be much easier and much less stressful for the bees. I opened the top covers and the feeders were PACKED with bees. Not only were they packed with bees, but the floats, made of cut sections of queen excluders, allow the bees to crawl underneath the floats. The entire bottom areas of the feeders were lined with bees who, theoretically should crawl back up through the queen excluder mesh to escape drowning. Removing the feeders and emptying the bees out is not nearly as simple as it may sound. I decided to take the risk in hopes that the bees would be smart enough, and fast enough to crawl back through the excluders before making contact with the syrup. No so. Some made it out, but the syrup was like a runny river of death for most of the bees left beneath the floats. What’s more, the floats were stuck to the side, so when I poured the syrup, the floats didn’t float! You can imagine at this point the girls were not happy with me, Beezilla, again… It was horrible for them, it was horrible for me. They were fed, it was dark, I was exhausted. Currently, I’ve left the top feeder on Blue Hive (BH3) because it does help with robbing, and because there are so fewer bees, they don’t line the feeders, so drowning is not a problem and the feeders work as intended. GH1 and YH2 are back to buckets. I can’t use buckets in winter because they are taller than the medium boxes and they leave a substantial gap at the top. I’m torn between the Collins Feeders, which are shallower bucket feeders with a wider distribution of holes and some other helpful features, or making adjustments to our existing feeders ($22 a pop!) so the bees can’t get down into the bottoms. I’m usually good about reading reviews, but somehow I overlooked the reviews for Brushy Mountain’s “no drown” feeders. None were good and all reiterated my exact experience. Ugh! Unfortunately for the girls, I learn the most from my mistakes and oversights, but the good news is that these lessons are hard to forget, even for my middle-aged “chipmunk” brain. So at least the future generations will benefit from the suffering and demise of their ancestors. The temperatures have been dropping and I’ve been thinking about and acting on all the things we need to do to prepare for winter. It feels like we’ve been working toward overwintering since April, and all of our efforts will soon be put to the test. Starting with feeders, all three hives now have the “no drown” top feeders. Blue Hive 3 (BH3) did have an enclosed plastic boardman feeder, which I’ve managed to collapse and create a syrupy mess more than once. Even enclosed in a medium box, I think this feeder attributed to their being robbed by Green Hive 1 (GH1). Now the top cover is tight and closes off the top entrance, resulting in one less access point for robbing. I also swapped out the bucket feeders in GH1 and Yellow Hive 2 (YH2). 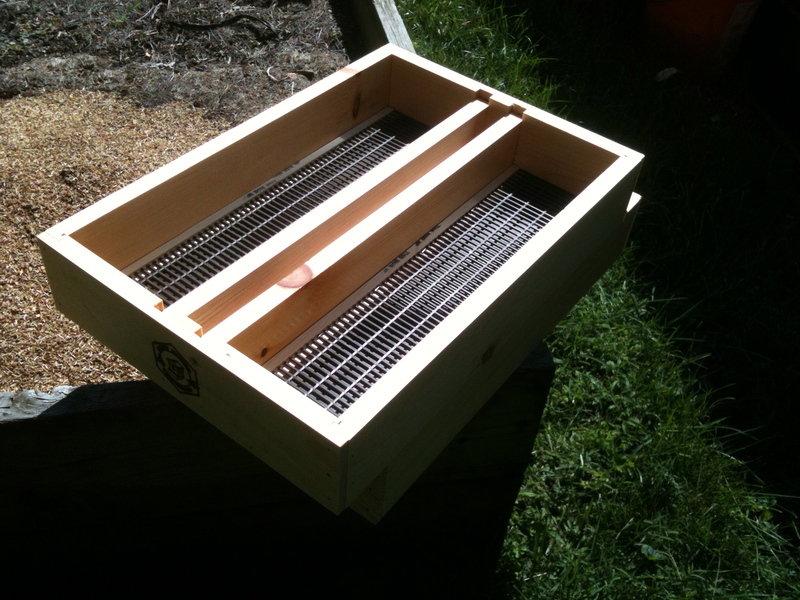 The bucket feeders work great for summer because they sit up slightly higher than a medium box, creating a draft at the top allows for ventilation. Now that the weather is cooler, the top cover seals in the warmth, plus top feeders are much easier to fill. I checked on BH3 yesterday and they had not touched the frames in their top box. At this point, I’m not counting on their building up more brood, but I’m still hoping they’ll draw out some comb and stores. GH1 and YH2 are packed with bees and they have tons of brood, so at this point, everyone is getting switched from 1:1 to 2:1 sugar syrup (that’s 2 parts sugar, 1 part water). We’ve been going through about 150 lbs of sugar every 3-4 weeks. GH1 can go through a gallon of sugar syrup in 2 days. It’s hard to keep up with them. 2:1 will go through even more. Ugh! No one said this hobby would be cheap. GH1 and YH2 are both packed with bees and there’s have more to come. I’ll leave YH2 in three boxes, but I’ll likely use a bee escape to reduce GH1 down to 4 boxes. BH3 will be the real challenge to get through the winter. Their numbers are few and I don’t see much brood. 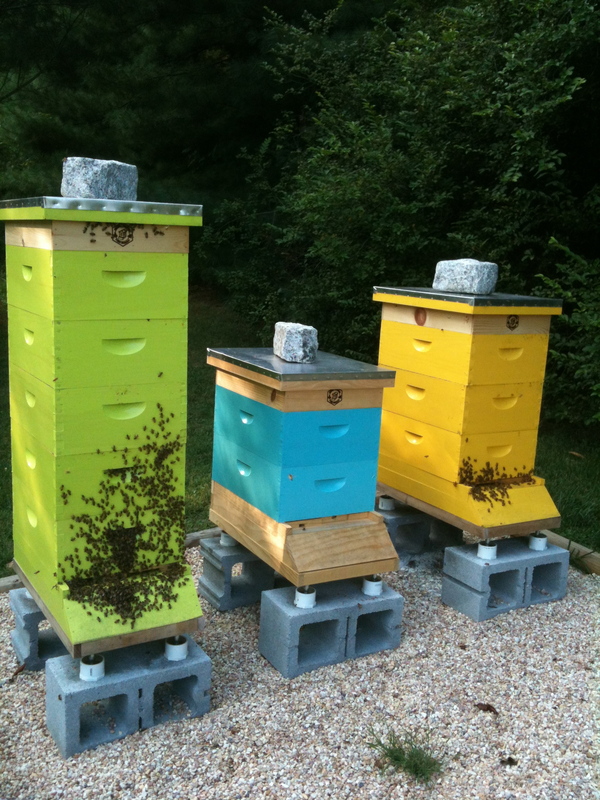 Their current two-medium hive is too large for winter. I could combine them with another hive, but I don’t want to lose that $50 Texas Buckfast queen. So I purchased a nuc box for their winter home. This nuc will include two 5-frame medium boxes. I’ll pack them in and do everything I can to keep them going. One big action item is to treat the hives for mites. Varroa and tracheal mites are a huge threat to bees, like ticks on dogs. I’ve been waiting for the lower temps before treating with a chemical-based solution called API LIFE VAR. Aside from using some essential oils in their feed, I have yet to apply any mite prevention tactics. 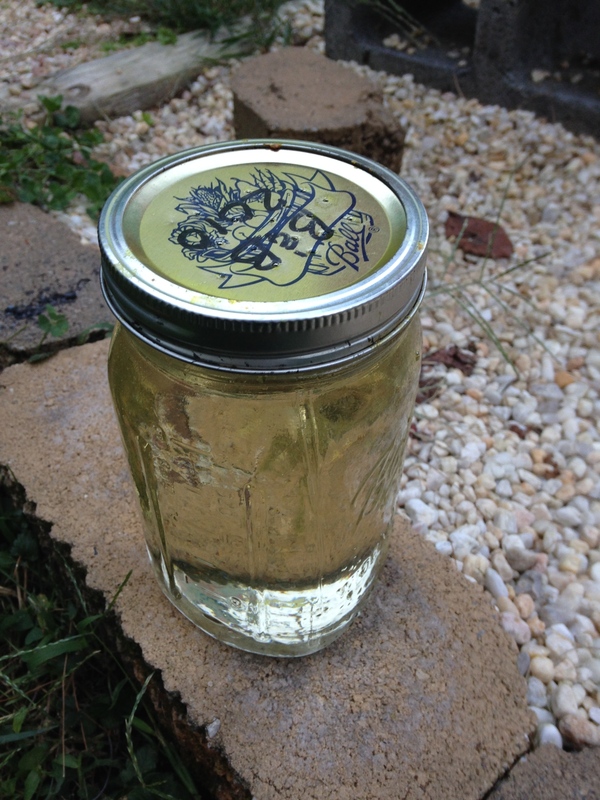 Next summer I hope to treat more using safer, more bee friendly methods, like fogging with essential oils and using oxalic acid; but as we are heading into our first winter, I’d rather play it safe and use something I know will work. 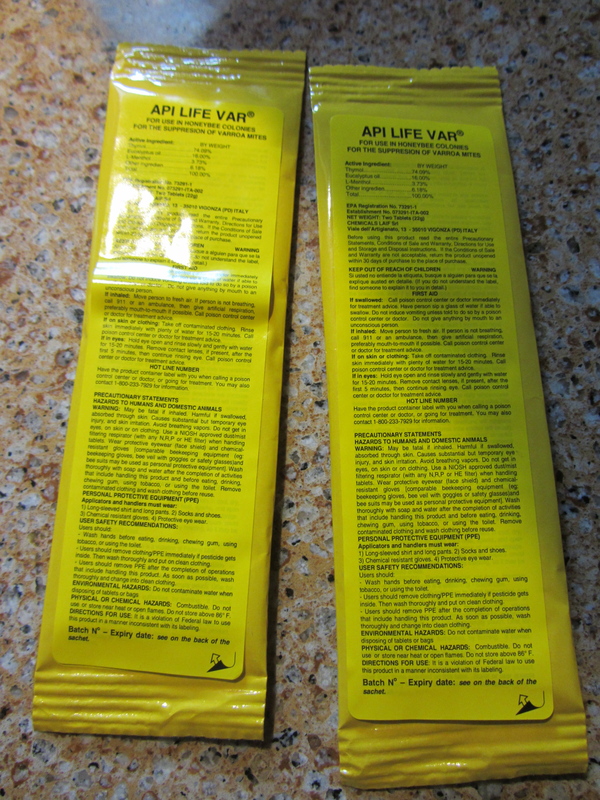 I chose API LIFE VAR because it is a “soft” chemical that will hopefully prove less harsh and invasive to the girls. 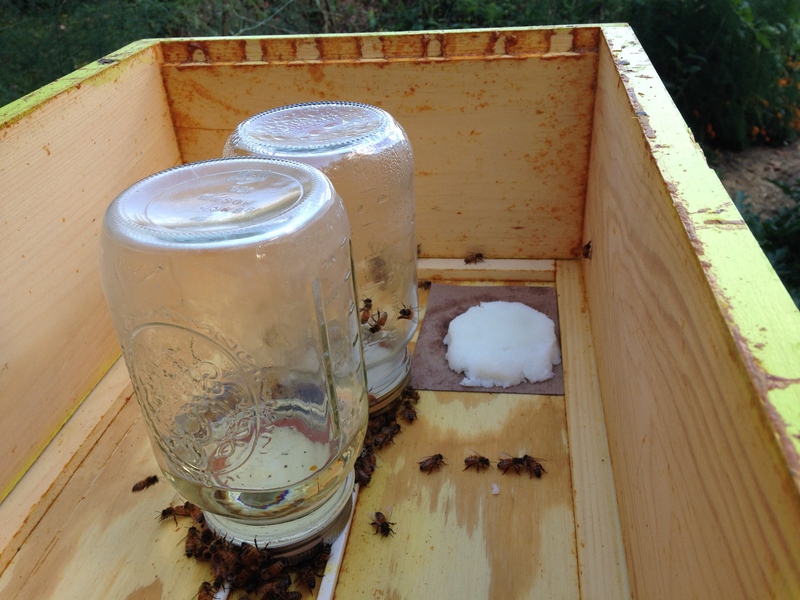 No chemical is good, but when we’re up again varroa, it is by far the lesser of two evils. And it is cheap. Less than $3 a pack. I’m treating Green Hive 1 (GH1) and Yellow Hive 2 (YH2), so 3 packs will get me through 3 weeks of treatment. The drawback is that, for 3 weeks, I have to dig into the hives every 7 days to add new tablets above the brood boxes. I wish there was a better option, but they’ll just have to tough it out. 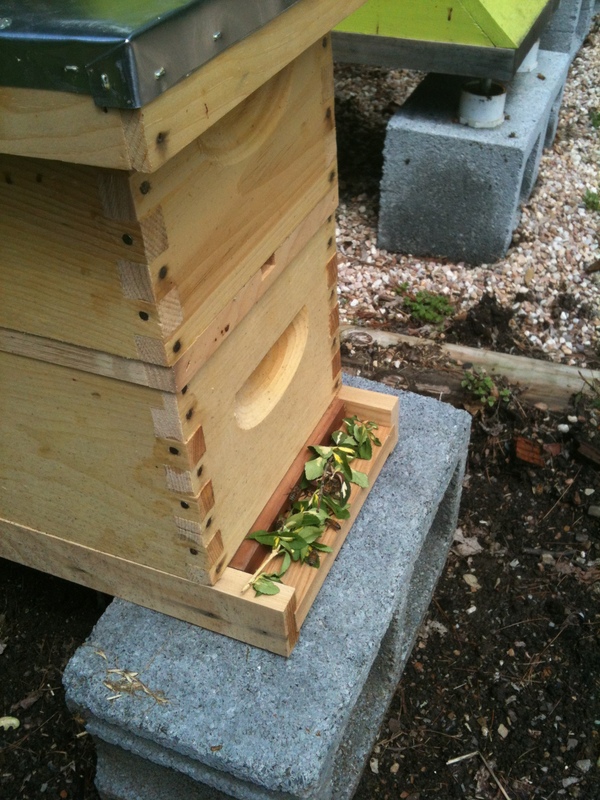 Blue Hive 3 (BH3) is far too small to treat, so therein lies another challenge for getting them through the winter. I may try a wintergreen treatment and a sugar roll in hopes that they’ll have some winter advantage against the mites. The API LIFE VAR looks like beef jerky, has the texture of brittle burned wood or charcoal, and has a powerful chemical smell. The warnings are scary – wear waterproof gloves when handling, don’t leave around heat or anything smoking, extra pieces in newspaper for safe disposal. Bottom line – this stuff is nasty. Again, not my first choice, but it has to be done. And this is the SOFT chemical. Yikes, I don’t even want to think what the hard chemicals are like. 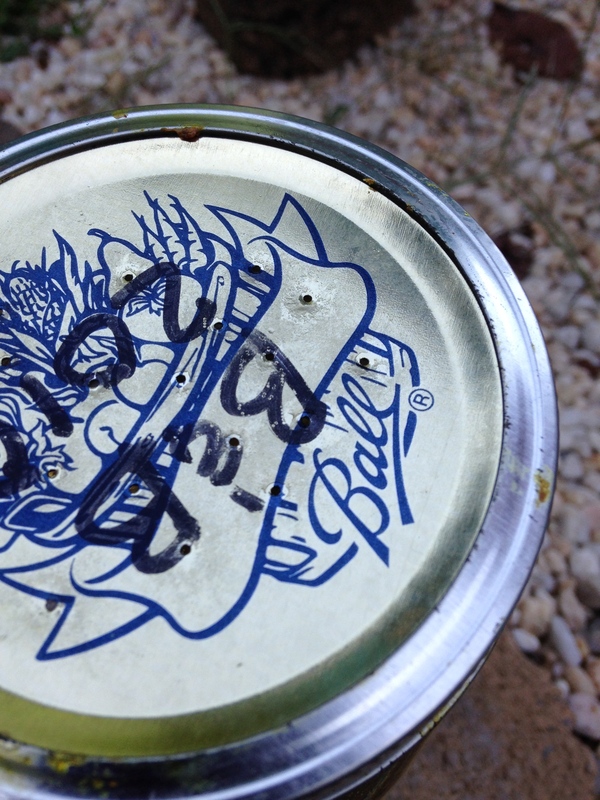 Lay it on newspaper and open it when you get up to the hives. Not in or around the house, and especially not around dogs or pets. Use scissors to cut the package in half length wise, then gently break each long piece into four even tablets. You’ll have 8 tablets total – this will be enough for treatment 1 of 3 for GH1 and YH2. 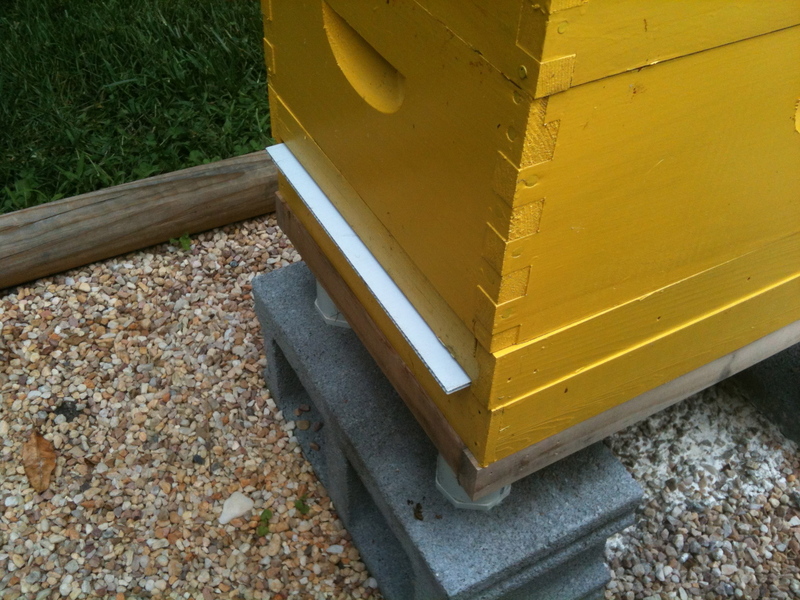 Close off the screened bottom board so the fumes remain in the hive. I used my mite count board. I even covered it with Crisco so when all is said and done, I can see just how effective the treatment is. Hopefully it will be covered with lots of dead mites, and no dead bees. On the top brood box, I laid the pieces on top of the frames on the four outer corners of the box. Do not lay the pieces in the center over the brood. Put the hive back together and let the API LIFE VAR do its job. I returned to the hive an hour later. I could smell the chemicals from 100 feet or more. The girls were not happy with me. The photo below shows the scene. No wonder they don’t like me. I’m Beezilla, creating havoc and digging through their home, and now I’ve stunk up the place. And I have to do it two more times! Yeah, there’s gotta be a better way. Before the bees arrived, we had some key decisions to make. 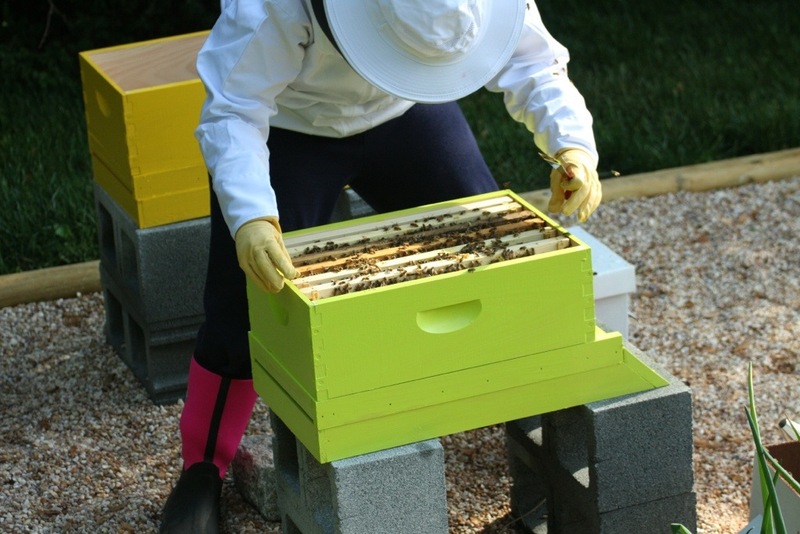 Its recommended that new beekeepers start with at least 2 hives. That way, if one swarms or dies for some reason, you have a backup. So, the next decision was what types of hive bodies to use? A bit of research confirmed my original thought. I chose 8 frame mediums simply because they be easier to handle. 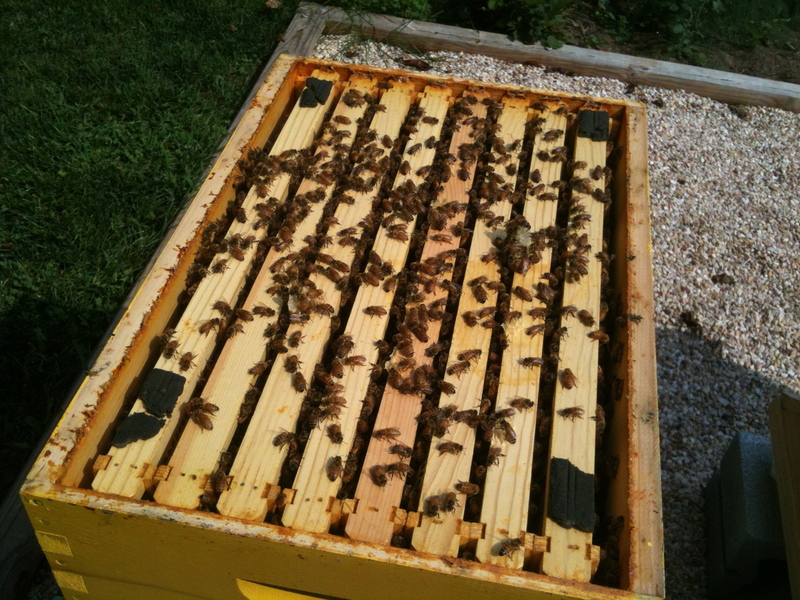 Brood and honey-filled frames can weigh about 5-7 pounds each. Multiply that by 8, then consider that up to 6 of these boxes will be piled upwards… oh yeah, my back will thank me. It’s also a good idea to pick one size and stick with it. That way all of my hive bodies will be interchangeable. I knew I wanted bright and fun. They also had to be different so the bees could differentiate their own hives. I chose golden yellow and lime green to add a splash of the warm tropics to our backyard. It worked! 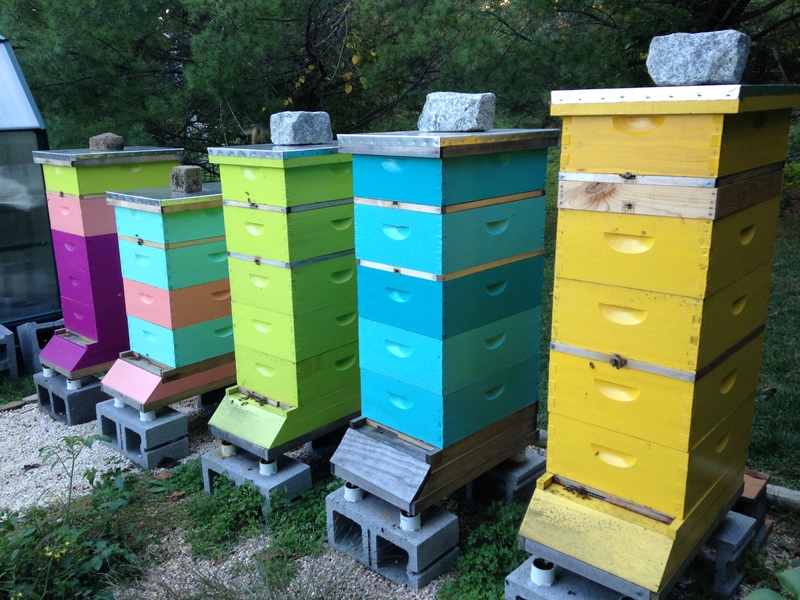 I love our bright colorful hives, and the bees seem to like them too. I selected a site facing east so it gets the morning sun, is not too close to the neighbors, is adjacent to the garden, is out of dog range, and is shielded between the greenhouse and some tall shrubs. We prepped the ground with landscaping fabric, lined the perimeter with railroad ties, and filled the space in with small landscaping pebbles. 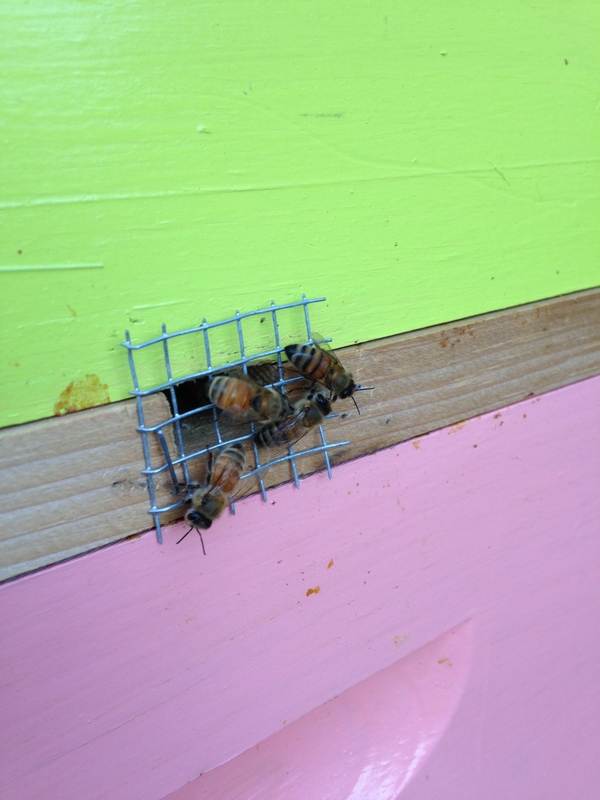 The hives – painted bright green (Hive 1) and yellow (Hive 2) – set about 2 feet up on cinder blocks. This was a no brainer. We chose nucs simply because we were starting from scratch. Now that we have filled in frames, I’ll probably purchase packages in the future. Bucket feeders are simple to use, inexpensive, safer for the bees, and closed off to ants, pests and robbers. The only downfall is that an extra box is needed for cover. I have yet to hear any good words about boardman feeders, and the open feeders just seem too….well…open. For our water source, we purchased a bird bath that automatically fills from a 2 liter soda bottle that screws into the center. As the water level lowers, more water is released from the bottle. So we just refill the bottle as needed. The water source went out before the bees arrived so that it would be the first source of water they saw. It worked. They drink from it regularly. Fun to watch their little bodies pump up and down when they drink. To provide resting spots for the bees, I filled the bottom of the bird bath with colorful glass nuggets, like you find in flower vases and aquariums. I love the way glass looks outdoors, especially in the water, and it works quite well for the bees. I took the easy route when it comes to equipment. I ordered a kit that included my first complete hive, hive tool, brush, smoker, boardman feeder (which I’ll be happy to give away if anybody wants one), a beekeeping book, and a great Brushy Mountain Intro to Beekeeping video. Definitely the way to go! So far our upfront decisions are working out well. But everyone is different, and depending on your bee situation, you may have made different choices. I’d love to hear what choices you made for your bees. Leave a comment and share how and why you may have done things differently (or the same) and how those choices are working out for you!